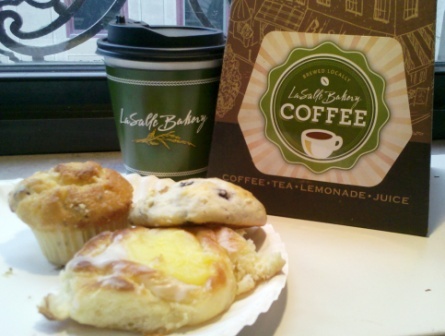 What makes LaSalle Bakery’s coffee taste so good? The answer is simple: Our coffee guy. Richard Alan is the man behind the magic and he is the only coffee guy LaSalle uses, for good reason. He embraces LaSalle’s old-school, old-world, no-shortcut philosophy, which means that you can taste his passion for coffee in every sip you take of his fresh, high quality, full-flavored roasts. The coffee is roasted and brewed just a mile down the road from LaSalle, so it’s just as fresh as if you roasted it in your own home! Stop in and pick up a cup of coffee, either iced or hot, in your favorite flavor! It’s the perfect addition to your pastry or sandwich any time of year. Are you picking up a breakfast or lunch platter for your next meeting or get together? Don’t forget to grab an on-the-go carafe of our delicious coffee to wash it all down! If you love the taste of our coffee but don’t have time to stop by the bakery on a regular basis, stock up on our 1lb bags of coffee and brew up a fresh pot in the comfort of your home! Available in the following flavors: LaSalle’s Signature Roast, Pete’s Italian Roast and Banana Hazelnut. Learn more about some of our favorite flavors! Banana Hazelnut: In 2009, LaSalle Bakery became one of the first in the state to offer a banana hazelnut coffee. While some were skeptical, the new flavor quickly caught on – first just in summer months, but it has now become one of LaSalle’s most popular flavors year round! As with all of LaSalle’s flavored coffees, the delicious flavor does not come from a sugary syrup added after your cup is poured – the beans are flavored as they’re being roasted, so you always get a natural, full-flavored taste. Pete’s Italian Roast: Pete was a Providence police officer and a beloved friend of LaSalle Bakery’s. He was a sweet guy who lightened up the bakery every time he walked in the door, which was about 3 times per day! His signature drink was the Italian Roast that we offered – he was never without one in his hand. Sadly, we lost Pete 4 years ago, but in honor of his memory, we named his favorite coffee after him. So any time you take a sip of Pete’s Italian Roast or see a police car go by with a Badge #169 sticker on it, think of Pete and the joy he brought to all of our lives. Wake up in the morning with a delicious cup of coffee from LaSalle, enjoyed in your home or amongst friends at the bakery. Swing by if you need an afternoon pick-me-up and pair a pastry with your favorite flavor of hot or iced coffee.